34 STAR AMERICAN FLAG COVER WITH A GREAT STAR PATTERN SURROUNDING THE WORD "UNION," OPENING YEARS OF THE CIVIL WAR, 1861-63, KANSAS STATEHOOD 34-star American national flag cover (a small 19th century envelope, used for correspondence) with an especially desirable, all-over flag design. The stars are arranged in what is known as the “Great Star” configuration, a star made out of stars, which is one of the most graphic and desired geometric designs. Great Stars come in many forms. This one is arranged so that it surrounds letters that form the word "Union." Kansas was admitted into the Union as the 34th state on January 29th, 1861, about 2 ½ months before the Confederate assault on Fort Sumter that marked the beginning of the Civil War. The 34th star was officially added on July 4th of that year, but most flag makers would have added a 34th star with the addition of Kansas in January. The star count remained official until July 4th, 1863, and 34 star flags would have been produced until the addition of West Virginia in June of that year. This abolitionist, Civil War example is one of the most beautiful of the period. 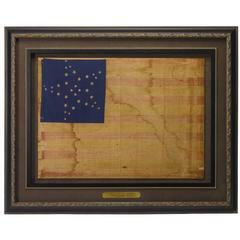 Among flag collectors, the Great Star configuration is the most coveted of all 19th century patterns. It probably came about shortly after the War of 1812, when Congressman Peter Wendover of New York, requested that Captain Samuel Reid, a War of 1812 naval hero, sought to create a new design that would become the third official format of the Stars & Stripes. A recipient of the Congressional Medal of Honor, Reid became harbor master of New York following the war. During his lifetime, he created many innovations in signal use, including a system that could actually send messages from New York to New Orleans by sea in just two hours. Use as a Naval signal had been the primary reason for the initial creation of an American national flag in 1777, but since there was no official star design, the appearance of our flag varied greatly. So Reid and Wendover’s primary concern centered on both consistency and ease of recognition. Their hope was as more and more states joined the Union and more and more stars were added to the flag, that it would remain easily identified on the open seas. So in 1818, Reid suggested to Congress that the number of stripes permanently return to 13 (reduced from 15) and that the stars be grouped into the shape of one large star. Reid’s proposal would have kept the star constellation in roughly the same format, in a pattern that could be quickly identified through a spyglass as the number of states grew. His concept for the stripes was ultimately accepted, but his advice on the star pattern was rejected by President James Monroe, due to the increased cost of arranging the stars in what would become known as the “Great Star”, “Great Flower”, or “Great Luminary” pattern. Monroe probably didn’t wish to impose this cost on either the government or civilians, so he suggested a simple pattern of justified rows. 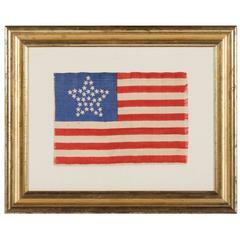 Never-the-less, the Great Star was produced by anyone willing to make it and its rarity today, along with its beauty, has driven the desirability of American flags with this configuration. Mounting: The cover was mounted and framed within our own conservation department, which is led by expert staff. We take great care in the mounting and preservation of flags and related objects and we have framed thousands of examples. The paint-decorated and gilded molding dates to the period between 1840 and 1870. The background is 100% cotton twill, black in color. The glazing is U.V. protective plexiglass. Condition: There is modest fading of the red pigment. 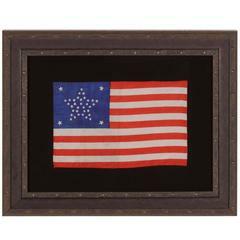 Frame Size (H x L): 8.5" x 11" Flag Size (H x L): 3" x 5.5"